Offer available to new members only. Offer ends 31/05/2019. Welcome to UK's #1 investment data & analysis software. If you are a private investor or trader looking to improve your skills and success rate, look no further. Find out more about us and our history. A Bloomberg terminal for private investors. Products and service so outstandingly good our readers cannot contain themselves. We are fully committed to helping all our customers become successful investors. Whether you are new to investing or more experienced, our continuous program of plain-English tutorials, articles and support will help you find quality investments for your portfolio. Our friendly in-house customer service team will support you all the way too. Hefty R&D expenditure has helped Craneware become a wonderful long-term investment. Maynard uses SharePad to evaluate the software group's attractive record and financials... and its premium P/E. Stock-picking needn't be complicated. Here's a guide to the characteristics to look for when buying your first shares. If you are new to investing, you may doubt your ability to match or beat the performance of professional wealth managers or fund managers. But you'll often be paying for mediocre performance and, as a private investor, you have several advantages over the professionals to help you out-perform. 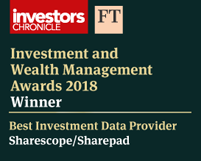 ShareScope & SharePad named 'Best Investment Data Provider 2018! ShareScope & SharePad has been the recipient of over 50 awards in 20 years. If you want to be able to pick winners, start with your investment software. 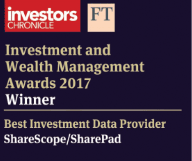 ShareScope/SharePad is consistently voted Best Investment Software by readers of the UK's top-selling investment magazines. In 2015 CEO & founder, Martin Stamp was honoured with the coveted "Editors Award for Services to Private Investors" by Investors Chronicle.